Artisanaware Modern and Contemporary Decorative Pillows, Designed and Created by Carol Tate. Green Home Fashion of Fabric Remnants and Recycled Apparel. Stylist: C Tate. Moroccan Room, Artisanaworks Showroom, Seattle. Botanical Illustration by Carol Tate. Quill Pen and Ink. Ficus Family. Intro to Sewing, Age 6. Carol’s Casige, German Made Toy Sewing Machine. Botanical Illustrator for Robert A Vines, Botanist, Houston. Tate is Second from the left. Botanical Illustration by Carol Tate. Quill Pen and Ink. Eugenia Cumini. Textile Artwork by Carol Tate, Featured in American Craft Mag, Hand Dyed Linen. 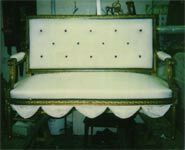 Custom Built Seating, Restoration and Re-upholstery of Antique Furniture, Carol Tate Co, Seattle. Carol Tate Co Designer Showroom, Seattle. Pillow Treasures and Textiles in Artisanaworks Showroom, Seattle. Stages in the Building of Custom Arm Chairs Featuring Two Loyal Employees, Gary Testerman and Jason Tate, Carol Tate Co, Seattle. 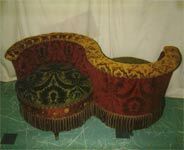 Antique Settee Reupholstered in Silk by Carol Tate Co, Seattle. 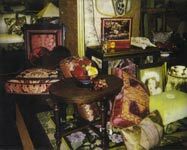 Tete a Tete Reupholstered by Carol Tate Co, Seattle for Brian Coleman Victoriana Specialist, Collector and Author. Seattle. Artisanaworks Showroom and Prop Rental Gallery, Seattle. Featuring Pillows, Exotic Finds, Architectural Salvage, Textiles, Furniture and Home Accessories. Botanical Illustration by Carol Tate for Robert A. Vines, Botanist. Quill Pen and Ink. High End Custom Down and Feather Inserts by Carol Tate, Artisanaworks. Moroccan Mosaic Tables Imported by C. Tate, Artisanaworks, Seattle. Hand Painted Surface Designs. Hand Painted Furniture, Carol Tate. Custom Cushion and Antique Textile Pillows Made for Amy Tan’s New York Loft. Hand Built Screen by Artisanaworks, Seattle. Moroccan Velvet Panels and Mohair. Artisanaworks Showroom and Prop Rental Gallery, Seattle. Collection of Morroccan Wares and Textiles. Artisanaworks Showroom and Prop Rental Gallery, Seattle. Collection of Fine Collectible Textiles, Pillows, and Hand Picked Moroccan Wares. Custom Built Upholstered Furniture for the Trade, Carol Tate Co, Seattle. Jason Tate Ties Coil Springs for the Seat Deck. Jason Tate and Carol Tate Build High End Sofa, Coil Spring Seat, No Sag and Marshall Spring Back. Carol Tate Co, Seattle. Carol Tate Textile Art. Hand Dyed Linen Base Relief with Cut Outs. Seattle. Carol Tate Mixed Media Painting. “Swarm” Series. Seattle. Carol Tate Mixed Media Painting/Drawing. “Swarm” Series. Seattle. Artful Artisanawear Fashion Apparel. Design and Construction by Carol Tate, Artisanaworks, Texas Hill Country. One of a Kind Green Fashion. Artisanawear One of a Kind Green Fashion Accessory Jewelry - Bracelets. Designed and Created by Carol Tate, Texas Hill Country. Artisanaworks Studio, Texas Hill Country. Modern Motif Surface Design by Carol Tate. Artisanaware Decorative Pillows, Designed and Created by Carol Tate. Cottage Style Pillows; Hand Printed, Hand Printed Fabric in Blue. Stylist: C Tate. Artisanaworks Located in the Texas Hill Country. Euro and Olde World Style Pillows of Vintage and Antique Textiles and Hand Printed Fabrics by Carol Tate. Stylist: C Tate. Cottage Style Artisanaware Decorative Pillows in Yellow. Green Home Fashion by Carol Tate In the Artisanaworks Workroom Studio, Texas Hill Country. Ethnic and Southwest Flavored Decorative Pillows From Carol Tate. Handwoven Textiles, Ikat Fabrics, Tribal Weaves…Reclaimed, Pieced, Recycled, and Eco Friendly Green Home Fashion. Pieced Luxury Textiles and Textile Pillows by Carol Tate, Artisanaworks. This Photo was featured in Fine Furnishings International. Mixed Media Construction from the “Swarm” Series. Carol Tate. Mixed Media Construction by Carol Tate.